Meaning within an artwork is not necessarily a given in the times in which we live. The work I make, especially as a sculptor, must at least begin to reveal an inkling of thought-provoking evidence within its subjective framework. Ecofeminism as the subject and the West (environment) as the object, are premiere in the relationship my industrial/mechanistic approach has to this very fragile environment. One can draw such a conclusion in Game, 1994; the industrial use of steel as enclosure (cage) of organic and live systems (endangered species, reservations, buffalo, elephant, et al.). This particular work represents ecofeminist principles in its exposure and identification of patriarchal culture. As an artist native to the Rocky Mountain region I have an innate interest in the environment that is inherent and personal. The aesthetic I embrace reflects an organic relationship to the geometric. This influence drives my desire to build, make, and create in such a manner that the artwork will reflect the monumental in art relative to the architectural space. 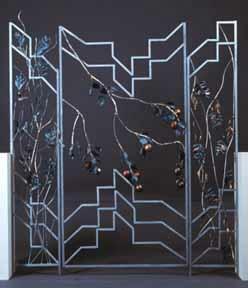 The use of metal as the material to make sculpture, furniture, gates/fences, body adornment, et al, is contemporary. My progress in the understanding of this material is underscored by a jeweler's aesthetic, translated into the monumental, and repositioned within an architectural language. The absolute connection of the architectural, a design sensibility and artistic language, are congruent to meaning and quality in the work. The intent is to meld the craft of metalsmithing with the sculptural and architectural in terms of the present constraints of global existence. Included within this union are the tenets: the immediacy of site specificity and plan, construction rather than deconstruction, fabrication, the marriage of materials visually and literally, and the integration of form with design. The aesthetic of the work includes the abstract, the conceptual, the decorative, the functional and non-functional, and encompasses both the interior and exterior site. Art by interpretation is a cultural and social construction, and as such, is public. The artist never creates solely for the self, but for an audience whose response is addressed by the meaning assigned to the work. To engage the public in meaningful internal/external discourse allows access to meaning, and stimulates the possibility of intellectual reverie. I was born into a Wyoming coal mining family that homesteaded from England at the turn of the century. 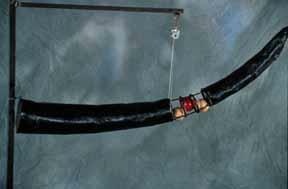 In the early 1970s, I privately studied metalsmithing, painting, and jazz guitar in Des Moines, Iowa. This study led to a career as a master jeweler for almost a decade at a principle store in Iowa. I returned to college in 1989 to primarily study art, and obtained an Associate of Art, a Bachelor of Art and a Master of Fine Art. The experience of graduate study at Cranbrook near Detroit, the hub of the Industrial Revolution, challenged my awareness as an artist. I was inspired to charge my work with meaning valid to current cultural and social constructions. Working in the Rocky Mountains regions as a metalsmith/sculptor, I have an innate interest in the environment that is inherent and personal. Western ambiance is fraught with prescribed meaning and lends to the idea of open space, environment and that which is wild or natural. Ecofeminist principles that juxtapose the urban-industrial moved to the center of my reality. Enclosure of natural systems of life (the Earth, nonhuman life, indigenous peoples, genetic code and cosmological systems, weather, water, et al.) is of prominent importance in my art. Reconstruction (and construction technically), as opposed to deconstruction, is an ideal that continues to influence my work. Editor's note: Debra Uhls' art works have been featured at universities, women's clubs and galleries across the country. Debra was Artist-in-Residence for the 1994-1995 session of Casper College, Casper, Wyoming and Western Wyoming College, Rock Springs, Wyoming. In 1996, the artist was commissioned to restore a 1923 W.W.I Viquesney Sculpture. In 1997, a public artwork was donated to the community of Rock Springs, Wyoming by the artist in conjunction with Pacific Steel and Bath Construction. The artist has shown at the Utah Arts Festival in Salt Lake city. Her work has also been shown at a Scholz Design home sponsored by Owens/Corning in Toledo, Ohio. The Collectors Corner at the Toledo Museum of Art featured Ms. Uhls' work on its Website in 1998 (www.toledomuseum.org). Most recently the artist is concentrating on making art furniture. All images and text © Debra Uhls.